Allen Iverson, Terrell Owens, Jose Canseco: Sad stories about retired athletes. The Longform guide to sad retired athletes. 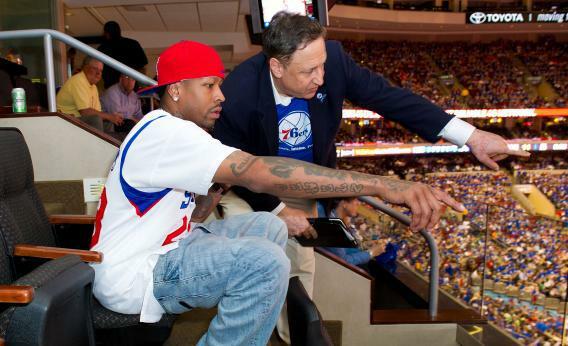 Allen Iverson watches a 76ers game with CEO Adam Aron at the Wells Fargo Center on May 23, 2012. Photo by Jeff Fusco/Getty Images for Reebok. Stepping off the field for the final time is tough for any athlete, but it was particularly brutal for the following group. The complicated post-baseball days of Joe DiMaggio. “Two hours later, dinner and the speeches over, DiMaggio was slumped in O’Doul’s car headed back to San Francisco. He edged himself up, however, when O’Doul pulled into a gas station in which a pretty red-haired girl sat on a stool, legs crossed, filing her fingernails. She was about 22, wore a tight black skirt and tighter white blouse. “‘Look at that,’ DiMaggio said. Basketball’s iconoclast is now a broke recluse. “For the past three years, as Iverson chased an NBA comeback, his marriage fell apart and much of his fortune–he earned more than $150 million in salary alone during his career–dissolved. Now, those who once ignored past signals have recognized that basketball may have been the only thing holding Iverson’s life together. “‘He has hit rock bottom, and he just hasn’t accepted it yet,’ says former Philadelphia teammate Roshown McLeod. “A few minutes before 8 o’clock, a black Suburban pulls into the players’ parking lot. At 7:59, the passenger door opens, and Iverson climbs out, shouting profanity. Then he notices Aron, who wraps his arms around Iverson. They walk toward the entrance, Iverson still shouting, for one more night under the lights. Five years after they leave the league, 60 percent of NBA players have nothing left. In the NFL, it’s closer to 80 percent after just two years. A breakdown of the economics of retirement. “It began in the winter of 1991 when he sank $300,000 into the Rock N’ Roll Café, a theme restaurant in New England designed to ride the wave of the Hard Rock Cafe and Planet Hollywood franchises. One of his advisers pitched the idea as ‘fail-proof, with no downsides,’ Ismail recalls. He never recouped his money and has no idea what became of the restaurant. Terrell Owens at 38: unemployed, nearly bankrupt after losing his shirt in a electronic-bingo entertainment complex development plan gone bust, father of four children (one of which he has never met), frequent bowler. Before he was a Twitter savant, Jose Canseco was a juiced-up terror. OK, so Don King isn’t an athlete and he hasn’t technically retired. But he’s certainly sad. “King speaks of himself as a transformative figure, someone who through sheer intellect, hard work, and determination overcame racism, both overt and institutional, and brought millions of dollars and international adulation to the young black men he promoted. All of this is undeniably true. But Don King’s PR problem is that we don’t see him as a civil-rights pioneer. We see him as a gangster—and as a gangster, he must adhere to the strict ethics of a gangster movie. He stole, without a hint of mercy or contrition, from his own people. “There is no forgiveness for the hypocritical gangster. On Stephon Marbury’s (not totally sad!) NBA exile in China. “This set off a long, hushed caucus among the Chinese parties. At last Cindy very antsily explained that due to a legal dispute between the team’s owner and the World Trade, the hotel issue was a matter of some delicacy. “But Mr. Song pursed his mouth and nodded sourly, giving the impression that he was not in the habit of indulging fussy requests from players. Marbury’s Chinese teammates, by way of comparison, didn’t get to stay in a hotel at all. They lived by the team’s rusting gym on the outskirts of town, in a dormitory of pink concrete with a big pile of coal in the yard. “Mr. Song agreed to take up the hotel upgrade—a $14-a-night proposition—with his boss, then he turned the conversation to basketball. The Brave Dragons, he said, were promising this year, having recently acquired a second American player, Jamal Sampson, late of the Denver Nuggets. The most important thing, Mr. Song said through Cindy, was that the fourteenth-ranked team finish in the top eight. “Marbury gave him a straight look and held up his index finger. ‘Number one,’ he said. “She cast a nervous eye over Marbury’s middle, which was a tad softer and rounder than it had looked beneath the lights at Madison Square Garden. Marbury nodded. “‘Auch!’ said Mr. Song, though whether he meant, ‘Auch—what a relief’ or ‘Auch—this person is completely full of baloney’ was not immediately clear. “’We believe in you!’ cried Cindy.